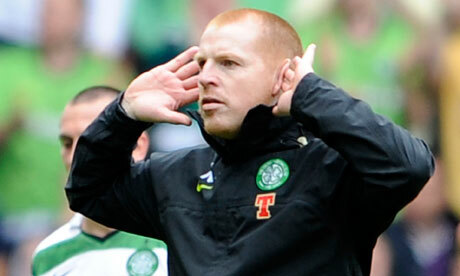 Congratulations to Neil Lennon for guiding his young Celtic side to the SPL title. What a fantastic achievement, and on the face of it, everything is rosy at Celtic. An average squad age of just 23, operating in a financially prudent manner, and looking forward to launching an attack on the Champions League next season. However, the headlines this season (aside from the financial crisis at Rangers) have been dominated by Lennon’s ill-tempered approaches to officials, when they could so easily have been about the positive aspects of the Glasgow club’s season. This petulant and puzzling behaviour again reared it’s ugly head when Celtic suffered a 2-1 defeat to Hearts in the Scottish Cup Final. Of course Celtic and Lennon have the right to feel aggrieved at that penalty decision that was at best, ill-judged and at worst, downright ludicrous, but what the Hoops boss did next was quite unprecedented. In a national semi-final, with 50,000 eyes on him in the stadium, and several million more watching at home, Lennon took it upon himself to dash on to the pitch and confront the referee in an aggressive manner. Treating this case in isolation, perhaps you could almost put it down to a freak loss of temper, but this is now the third incident in a matter of weeks, and it’s getting to the stage now where the Celtic support are having to watch the name of their great club being besmirched by the manager’s thuggish actions. 18th March, Celtic are denied a debatable penalty in the League Cup final. Lennon doesn’t like it. Lennon criticises the referee’s decision. Lennon is warned about his conduct. Celtic lose the match (and the Cup). 25th March, Celtic suffer two red cards in an Old Firm match. Lennon doesn’t like it. Lennon foolishly approaches the referee at half-time. Lennon is reprimanded. Celtic lose the match. 15th April, Celtic concede a dubious penalty in the Scottish Cup semi-final. Lennon doesn’t like it. Lennon gives the ref a mouthful. Lennon will be punished. Celtic lose the match. Let’s say for the sake of argument that Celtic have fallen victim to poor officiating in the above matches. Let’s also again take each game on it’s own merit. First up, the League Cup final. If Celtic require an injury time penalty at Hampden to draw level with a distinctly average Kilmanock side, then the manager has failed to motivate and organise his team to do a job. Next up, two red cards in an Old Firm match. Lennon decides to drop Kelvin Wilson for this match after a poor performance in the cup final, only to bring in one of the biggest bombscares I’ve ever known in Cha Du Ri. Cha’s sending off was by far the more suspect looking of the two but you’ve got to ask yourself some key questions. Why would this below-par player even be on the field? And why did he allow himself to be caught so far up the park, when Celtic had fielded a 5-man midfield? As much as the decision was a joke, I’m firmly of the opinion that Cha shouldn’t have been anywhere near the team, and even if he was, then he should have the savvy as a professional football player to be able to conservatively hold the right-back position as part of the 4-5-1 tactic deployed. Wanyama’s red card is unquestionably deserved. Two-footed tackle off the ground is a straight red any day of the week. Yet still, Lennon makes a fool of himself by challenging the referee in the tunnel at half-time (something we all know isn’t allowed). Finally, and most recently, another Hampden park non-event for Celtic. It took Lennon’s Celtic over 35 minutes to register a single shot on target, despite admittedly dominating the game. The longer the match went on, and with Ki hitting the post from close range twice, the match was always going to swing in the Gorgie club’s favour. As previously discussed, perhaps Celtic shouldn’t have had a penalty given against, then, but the fact is that Celtic should have done more to win the match. Many of Celtic’s top players didn’t turn up. Of course Ian Black should have been sent off for that horror tackle on Joe Ledley, and the officiating standard was poor, but at which point was Lennon going to mention the fact that Hooper’s equaliser could have been given as offside? As if the aggressive confrontation to the officials wasn’t embarrassing enough, the Celtic manager then took to Twitter. Why Celtic’s manager engages actively in social media at all is beyond me. I’ve long cringed at his interaction with what are clearly adolescent teens and ill-informed, angst ridden punters who’re partial to making a call to football phone-ins. His comments via this medium have often been knee-jerk, but Sunday night’s tirade of nonsense was a new low. For those of you who may have missed it, the Celtic boss indicated that he felt his side had received a disproportionate number of ‘dodgy’ decisions in big games, and these latest ones were “personal”. What a myopic and ill-thought out reaction. There are so many statistics and incidents to counter his argument that I don’t know where to start, but a good place could possibly be the last time Lennon’s men met their Scottish Cup opponents at Tynecastle earlier in the season. Hearts, as we all remember, were denied a clear goal against Celtic early in the match on this occasion, before Celtic went on to score at the other end, and ultimately hammer the Jam Tarts 4-0. Was this officiating blunder “personal” too? To avoid the inevitable accusations that I’ll be faced with for being selective in my use of facts, let’s look at the penalty awards in the SPL, for this season and last. 2010/2011 season – Which team do you think were awarded the most penalty kicks? Yes, you’ve guessed it. Celtic, with 13 penalties. That same season, Celtic also conceded the fewest penalty kicks. This season, although obviously not finished yet, the Bhoys have again conceded the fewest penalty kicks. So where’s the conspiracy? Where’s the clandestine collusion? Or is it all just hokum from a paranoid manager with a persecution complex? Lennon has faced things off the park that no professional, and no human should have to endure. For this reason I retain a modicum of respect for Lennon, solely because he stood up to the bigots and didn’t allow his dreams to be taken from him, but his increasingly bizarre behaviour indicates to me that this job in the goldfish bowl that is Scottish football is an unsuitable one for a clearly unstable individual. Always a fiery individual during his playing days, but I’m struggling to see why he can’t recapture the discipline that saw him play at the highest level. Lennon’s actions have repercussions not only for himself, but for the club’s reputation, and the next generation of Celtic fans. It seems like a lifetime ago when Lennon was an integral part of the team that made it all the way to Seville, playing “the Celtic way” and winning thousands of plaudits from all over Europe. Celtic were the likeable sleeping giant of European football, with a fanbase that were clean-cut and fun-loving, so much so that they received the FIFA Fair Play award that year. What must those one-time appreciators from all over the continent thing when they see the manager of the famous Glasgow Celtic behaving like a common thug? The fan-base too are in danger of being reeled in by this persecution complex. The “them and us” tribal mentality from bygone years looks as though it could be returning in the minds of many of the more impressionable Celtic fans. I’d sincerely hope that this doesn’t continue to creep into the Celtic support. Sunday also showed that poor officiating isn’t just a Scottish problem. South of the border a match was decided by a horrendous mistake from the guys calling the shots. Spurs could potentially have lost out on silverware too as a result of Juan Mata’s goal that never was for Chelsea. After the match, did ‘Arry Redknapp (not that he’s fit enough to) dash across the park in pursuit of the referee to vent his anger? No. He also didn’t bring the game into disrepute by insinuating that a conspiracy was behind his side’s failure to capture points from the match. Instead he spoke calmly to the media, and backed the inevitable introduction of goal-line technology. Altogether, a more classy approach to an officiating failure where more was at stake for his men. There’s so much going for Celtic at the moment, so why do the support and the likes of Lawell tolerate idiotic behaviour from the manager. The fans wouldn’t tolerate this nonsense from Martin O’Neill, Wim Jansen, Gordon Strachan, or anyone for that matter, so why does Lennon get away with it. It’s time for Neil to hold his hands up when he loses in big matches. It takes a big man to say, “I got it wrong on the day” or “the best team won.” Lennon needs to focus on being the manager of Celtic football club, before his actions make his position at the club untenable. Time to shape up or ship out. I was talking about Lennon today. No Celtic fan will hear a bad word about him because he is “Celtic Minded”. I think the Celtic board have a fantastic opportunity to go out and bring in someone with class, dignity and more importantly motivational and tactical skills. Celtic are in a position that they could dominate Scottish football for years. They couldnt fail to win the league this year with all the goings on at Ibrox but i just feel Lennon hasnt got what it takes on the big stage. I hate to say it but i fear Celtic will crash again at the group stages against a minnow from Norway, Latvia or Estonia. I just have no faith in Lennons team selections or tactics anymore. sure you will be better thought of.